On the tip of the breathtaking Baja Peninsula, Barceló Los Cabos Palace Deluxe is situated in a premier location in San José del Cabo. 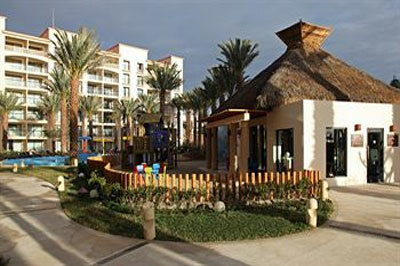 This all- inclusive resort features numerous amenities for all travelers. Brilliantly situated in the heart of the golden zone of San Jose del Cabo, right on the beach and just steps from downtown. Located 20 minutes from Los Cabos International Airport, 5 minutes from downtown San Jose del Cabo and 25 minutes from downtown Los Cabos. 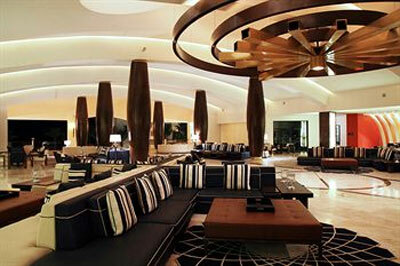 This hotel has been recognized with the TripAdvisor 2012 Certificate of Excellence. A prestigious recognition based on our users’ opinions, who rate our hotel through their reviews, is undoubtedly an exceptional achievement. Spacious Family Suite Deluxe(809 sq. ft.) near the kids club and the water park splash deck, with pool or garden views, small balcony, one king bed, plus a separate living room a 2 level trundle bed, and two bathrooms with shower, one of which includes a bath tub. Maximum occupancy: 2 Adults, plus 2 children (under 7 years). Lavish suite (549 sq ft.) including furnished terrace with spectacular views of pool grounds/garden landscapes, and partial ocean view, your choice of king or two double beds, sitting area with sofa, dual function vanity, desk, dining table with chairs for two, oversized marble bathroom with jetted tub and a separate walk-in rain shower. Maximum occupancy: 2 Adults, plus 2 children. 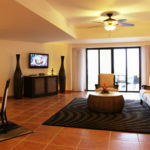 A plush suite (549 sq ft.) with spectacular view of the Sea of Cortez. 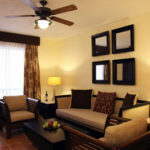 Select your choice of king or two double beds, living room with sofa, dining table with chairs for two, spacious bathroom with jetted tub and a separate walk-in rain shower. Luxurious amenities including: pillow menu, wireless internet free, unlimited reservations at the specialty restaurants, local calls free, club premium lounge access where our club guests are offered : canapés all day, premium brand drinks and concierge service, early check in and late check out per availability at no additional charge. Maximum occupancy: 2 Adults, plus 2 Children. Unique pool level swim-up junior suite deluxe (676 sq. ft.) includes: a terrace, pool and garden view, your choice of king or two double beds, small lounge with direct access to the pool, swim up bar from the unit terrace, oversized marble bathroom with jetted tub and a separate walk-in rain shower. Maximum occupancy: 2 Adults and 2 children under 12 years old. This suite is ultimate in space and comfort (1,2810 sq. ft.) and includes: a terrace, king bed and two double beds, bathroom with bathtub, plus an additional half bath, living room and dining room. Maximum occupancy: 4 people regardless of age. Romantic honeymoon suite (1,104 sq. ft.) includes: an oversized furnished terrace with dual access from bedroom and living room, with spectacular ocean views, king d, lavish romantically themed bathroom with Jacuzzi for two, a separate walk-in rain shower, and an additional half bath at the suite parlor and dining area. These rooms have the option to have a connecting Junior Suite Deluxe Club Premium with two double beds for an additional fee. Maximum occupancy: 2 Adults. 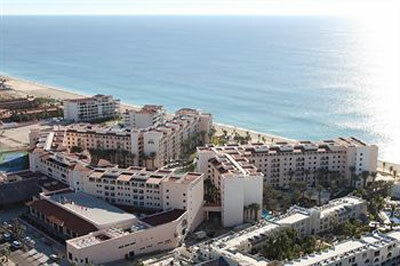 Luxurious and contemporary penthouse suite with the most spectacular ocean view (1950 sq. ft.) offers: a private and spacious furnished terrace with plunge pool, oversized bedroom with king bed, sitting area, bathroom with Jacuzzi tub for two, walk-in closets, additional half bath, living room, dining room, high-counter bar, dressing room and desk. Maximum occupancy: 2 adults, plus 1 child. These rooms have the option to have a connecting junior suite with two double beds for an additional fee. Barceló’s brand new, sleek beach front resort is 619 suites of sophistication framed in the rustic beauty that is San Jose del Cabo. 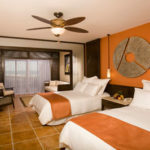 This all-inclusive, all-suite resort is wrapped in refreshingly stylish touches and innovative design including 34 specialty swim-up suites (the first and only in the destination of Los Cabos), American sports bar, cigar lounge, and much more. In addition to upscale accommodations, it also boasts 8 themed indoor restaurants, including two outdoor grills, swim-up pool bars, a world class spa, convention center, and exceptional personalized service. Professionals with a desire to reflect the art of bullfighting in the ambience and culinary proposals on offer. When a meal is accompanied by a good wine, even the outcome maybe a bit of confusion between cheers and ole! 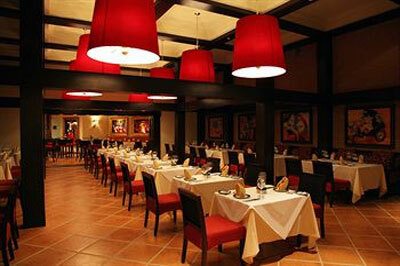 This restaurant is quiet and modern and has a tranquaillity and elegance. They offer five settings: Tatami Room, sushi bar, Teppanyaki table, private rooms and dessert table. Based on Gae Aulenti’s redistributation of the Gare d’Orsay railroad station in Paris, creating an atmosphere of classic sophistication and elegance. This restaurant is designed using pure forms, contrasting with deep wood textures that recall works by Botticelli. This restaurant is inspired by the sea with marine motifs and colors that complement the main character of this restaurant, which is, of course, the Sea of Cortes and its beach. The outside is stunning , with pergolas offering shade and teak furniture on a wood deck, overlooking the sea. Taking cues from the sea breeze rustling through the palms and the natural beauty of the sand and sea, the Coral Grill Seafood Restaurant focuses on the simplicity of enjoying quality succulent seafod and authenic brick pizza ovens. Relax in the invigorating open air dining space amidst a perfectly marine motif. The resort’s world-class, 18,000 square feet spa offers rejuvenating treatments to renew both body and soul. Visitors can lounge in one of the 16 air conditioned cabins or one of the three outdoor palapas, sauna, steam bath, hydrotherapy area and our beauty salon will complete your pampering experience. 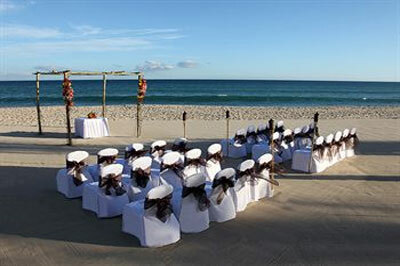 The Barcelo Los Cabos Palace Deluxe Resort is a lovely place to hold a wedding or a renewal ceremony. You can choose from two packages ( available to view online) or you can contact one of the experienced wedding planners to chat thru your requirements. The Wedding Planners can talk you thru your plans and budgets and guide you through all the legal requirements. They will be able to discuss with you all of your ideas and wishes to make sure your day is exactly as you want it to be. 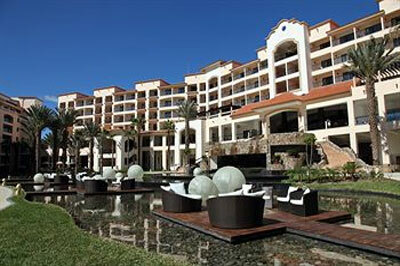 The Barcelo Los Cabos Palace Deluxe has implemented a New Resort credit of $550 USD per room per stay, applicable as of December 15, 2012 for new bookings. This promotion will be valid until December 31, 2013 and will be combinable with any promotion, the minimum stay required to apply this new Resort Credit is three nights. 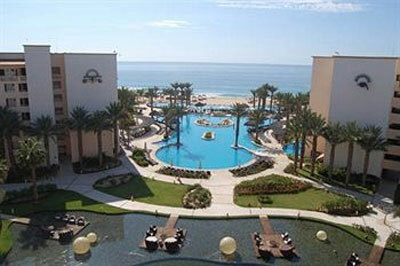 Clients will receive the $550 US in Resort Credit Coupons upon arrival. 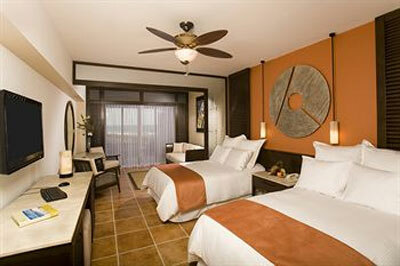 Services included: Romantic dinner, upgrade on rooms, Spa services and more.